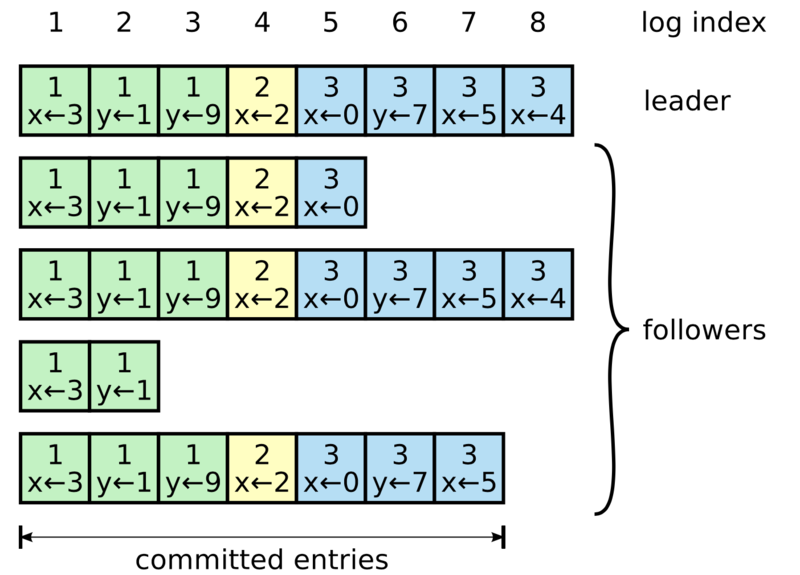 Keeping the replicated log consistent is the job of the consensus algorithm. The consensus module on a server receives commands from clients and adds them to its log. It communicates with the consensus modules on other servers to ensure that every log eventually contains the same requests in the same order, even if some servers fail. Once commands are properly replicated, each server’s state machine processes them in log order, and the outputs are returned to clients. As a result, the servers appear to form a single, highly reliable state machine. 在Kafka的高可用策略中, 也采用了相应的策略: Leader先写日志, 在成功同步到半数以上的Follower之后, 才返回给客户端ack. 时间序列编号(Terms act as a logical clock in Raft), 每一次Election之后, term 会递增. Raft divides time into terms of arbitrary length. Terms are numbered with consecutive integers, and each term begins with an election. 选取的时候会查看 被选取的candidate的时间序列term和对应的log Index 和 自身的对比. Leader接收到消息之后, 需要写入log, 并将这些log同步到大多数的Follower 去, Follower 返回ack 之后, Leader 才返回给Client ack. 所有的交互都是跟 Leader 进行, 变化会写入 Leader 的log, 再进行 Log Replication, 采用的方式为 Append Entries. Large-scale systems that have a single cluster leader, such as GFS, HDFS, and RAMCloud, typically use a separate replicated state machine to manage leader election and store configuration information that must survive leader crashes. 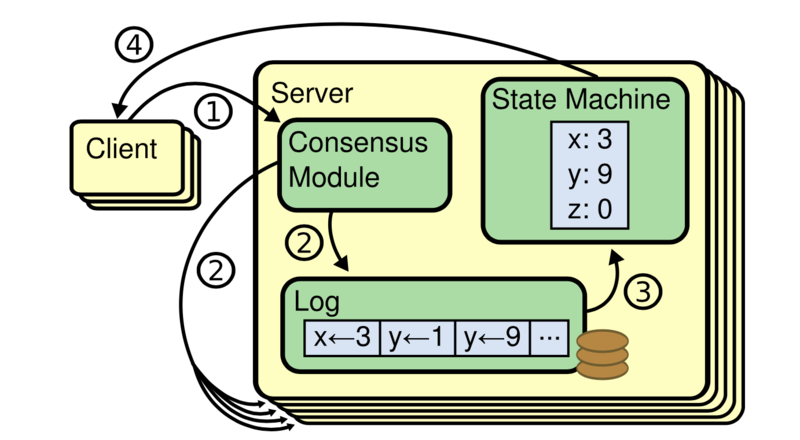 Examples of replicated state machines include Chubby and ZooKeeper. 如果超时了, 会再次进行选取, 此时如果有多个Follower变成了Candidate(Split), 则 有可能谁都不会胜利, 拿不到大多数的投票, 此时会变回Follower, 并进行随机时间区间(150ms-300ms)的等待 (randomized election timeouts), 再进行下一步的leader选取. If followers crash or run slowly, or if network packets are lost, the leader retries AppendEntries RPCs indefinitely (even after it has responded to the client) until all followers eventually store all log entries. 通过term值和log的最大的index, Leader可以知道Follower的Log Entries是否已经追上或者是落后. 如果发现落后了, 则在下次心跳的时候, 再将数据进行同步. 可以证明, 所有已经commited 的 entry, 在所有的机器上是一致的.